After all that skiing, snowboarding, and running around in the snow, you are bound to get hungry. Here are a few delicious Korean dishes that are even better in winter. We’ve selected popular dishes that are easy to find within resorts or nearby eateries. 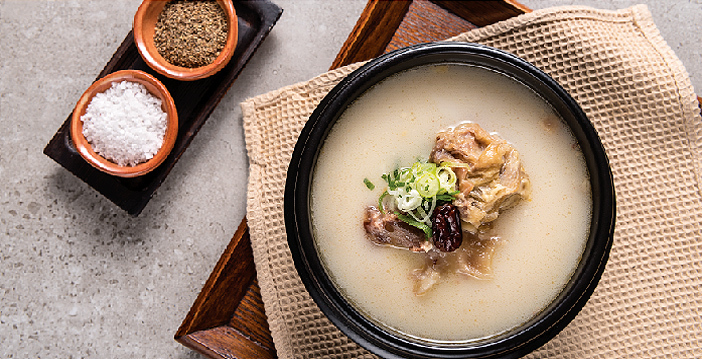 Get a taste of what Koreans eat to keep their bodies warm in the winter. Instant Noodles The most common late-night snack in Korea Spicy ramyeon (instant noodles) is probably one of the most popular snacks/fast foods in Korea. A bowl of the hot and spicy noodles is ideal on a cold winter day, after a long day of work, as a late night snack or just pretty much anytime of day. RICE CAKE SOUP Savory and filling On Lunar New Year’s Day, the whole family gathers around the table for a bowl of rice cake soup. This hearty soup is made by boiling sliced rice cakes in bone or beef broth. Different regions of Korea have their own version of the soup, so if you have the chance, try rice cake soup (tteokguk) in different parts of Korea. FISH CAKE SOUP Taste of the sea Fish cake is made of mashed fish meat, salt and sugar then balled, rolled or flattened before steaming or frying. There are many different ways in which to cook fish cake, but the most popular ways is skewered and made into a soup. On a cold and windy winter day, a bowl, or cup, of fish cake soup will warm your whole body. OX BONE SOUP A bowl-full of nutrition Ox bone soup is made by simmering beef and bones for a long period of time. The white and rich flavored soup was a popular health food for kings. It is served over rice or noodles and topped with sliced beef. Ox bone soup is usually served in an earthen pot called "ttukbaegi" to retain the heat until the very last spoonful. BULGOGI HOT POT Everybody's favorite dish The most common recipe for bulgogi is to marinate thinly sliced beef in a sweet and savory sauce, then grill. For bulgogi hot pot, marinated beef, sliced mushrooms, and other vegetables are placed in a shallow hot pot and cooked slowly over low heat. After everyone's "almost" finished, Koreans usually mix rice with the leftover broth. NOODLE SOUP Noodles served in a hot broth Garak guksu in Korean, this particular noodle soup uses thick noodles and is very similar to the Japanese udon. The hot soup makes this dish ideal when out in the cold. The anchovy or kelp based broth is flavored with crown daisy leaves and garnished with seaweed flakes. If you like spicy food, you can add Korean chili powder.